82% of male students did not anticipate going through Clearing, compared to 61% of females, according to a survey commissioned by London South Bank University (LSBU). The survey, conducted by leading market research specialists Youthsight, asked previous Clearing entrants currently studying at UK universities questions about their experience of the Clearing process. The survey revealed that male students are considerably more confident than female students of securing the grades they need for university. This indicates a potential gap between perception and reality. Data from the Joint Council for Qualifications in 2014 found that females outperformed males in their A-level results, with 54% achieving A* to B grades compared to 50% of males. Professor Shân Wareing, Pro Vice-Chancellor for Education and Student Experience at LSBU, said: “The survey results indicate that a significant number of students were surprised to find themselves in Clearing. Because things don’t always go to plan at this very important transition in students’ lives, it is important for everyone waiting for their A-level results to consider their options in case they do need to go down the Clearing route. Eleanor Unsworth is studying Children's Nursing at LSBU and was surprised how easy and simple it was to secure her university place through Clearing. Eleanor said: "I was concerned about going through the Clearing process, but it was a lot simpler than I thought. Clearing is the process that gives students a final chance to apply for a university course beginning that September. 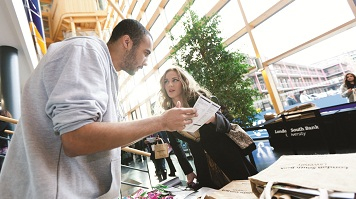 Many students who do not receive an offer of a university place can use the process to get on to a course. Universities receive the vast majority of Clearing enquiries on A-level results day, which this year is Thursday 13 August.